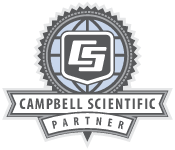 The Integrated Air Services (IAS) group at Weston Solutions, Inc., provides data-collection and telemetry solutions based on Campbell Scientific platforms tailored to clients' needs. Our primary applications are air-quality related, using meteorological stations and real-time air-monitoring stations. We have also provided logger-based solutions for trace-gas ambient-air monitoring and continuous-emissions monitoring (CEM). Weston IAS has leveraged its over 20 years of Campbell equipment experience to non-air applications. We have worked with systems involving water quality, energy metering, and industrial/SCADA components. We deliver turnkey data logging and telemetry systems for rental, or assist clients building their own systems. Our experience ranges from a single logger to a network of over a dozen loggers monitoring a lightning system, water systems, weather stations, a truck scale, roadway conditions, a green roof, and more. Advanced features of our systems include logger-originated e-mail notifications, logger-to-logger networking, voice modem alerts, and event-based data collection. In addition to providing hardware and logger programming, we also tailor data-automation solutions to process and present collected data. Weston IAS uses RTMC and its own databases to present & manage data, including via web pages. We look forward to helping meet your challenges.